Neil Jordan (Mona Lisa, The Crying Game) returns after a six-year hiatus with Greta, a psychological thriller with horrific tendencies. With a strong performance from Isabelle Huppert and Jordan’s sleek direction, Greta manages to be entertaining despite its often times wackadoodle 90s-inspired antics. Greta is a somewhat bonkers and hilariously horrific iteration of If You Give a Mouse a Cookie — think If You Return a Stranger’s Handbag — that pays homage to the stalker films that populated the 90s. In many ways, it’s a maternally Freudian Single White Female, a melodrama of mother/daughter issues that slowly turns increasingly more and more nightmarish. Though not exceptional by any means, the film manages to succeed by the grace of its performers, who all embrace the film’s absurd premise and looney qualities. 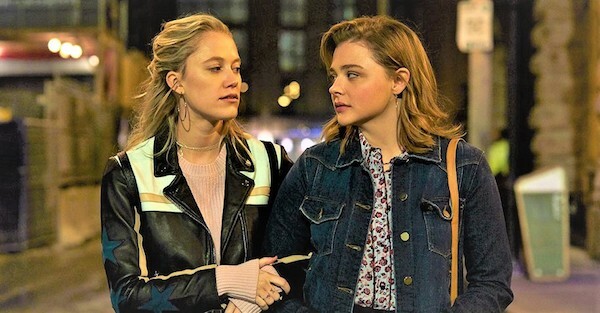 Chloë Grace Moretz really nails the warmth and kindhearted quality of Frances, a small town girl who has yet to really feel the effects of New York City. She gives Frances a doe-eyed look (which she leans on a bit too heavily here) and is believable in her naivety; however, the restrained range of her performance sometimes undercuts the potential emotional effect. Huppert is the true star here, and the film is working at its best when Jordan let’s her roam freely, wobbling between sweet old lady and deranged stalker. She knows exactly what kind of B-Movie pulp Jordan is making (even if he sometimes doesn’t), and she dives headlong. Maika Monroe also gives the film a nice shine in her supporting role as the world-wise friend/roommate, Erica, who cautions Frances early on of the perils of being kind to strangers. Frances and Greta’s relationship begins with seemingly kind and warm intentions. The pair quickly become friends, bonding through the mutual lose of a loved one (Frances’ mother, and Greta’s husband). The two have dinner dates, and even pick out a dog together; however, nothing is quite as it seems… Their relationship doesn’t remain wholesome for long — a story element which is undermined by being pretty visible to the naked eye, but there are some nicely tense moments in this glossy thriller that successfully get under the skin. However, Greta’s biggest fail is that it lacks many surprises; it is exactly what you’d expect. The twisted mother/daughter dynamic is an interesting angle, but it’s a bit underutilized, sticking only at surface level, never really giving the psychological density necessary to wholly engage. Tonally, it’s a bit uneven. Some scenes may startle some and make others chuckle — it’s hard to tell if Jordan wants us to be laughing or frightened; however, the right kind of audience can easily enhance the experience of this type of “bad” film. It’s a mess, and it’s a bit too long, but if you have the right frame of mind, Greta can be a pretty good time. There are some memorable moments strewn about (a great one involves a cookie cutter) and a highly entertaining performance from Huppert. Through all its absurdity, there lies a somewhat flimsy messages about loneliness and the flaws in our laws/bureaucratic system that make it easy for insane creeps to turn anyone’s life into a living hell. So, in that sense, it’s slightly educational. Just remember: be wary of strangers and never return lost items you find on the subway — just take the money and run. The film opens nationwide on March 1st, so mark your calendars for a kooky night at the cinema. Recommendation: It’s nothing groundbreaking, and it’s far from being the best thing you’ll see all year, but Neil Jordan and Isabelle Huppert make Greta a messy thriller worth watching. Rating: 3 handbags outta 5. What do you think? Are you excited about Neil Jordan’s new thriller? We want to know. Share your thoughts and feelings in the comments section below, and as always, remember to viddy well!